Is your Michigan home under-insulated? Save on your energy bill and increase your home comfort with expert insulation installation from the most trusted home improvement contractor in Metro Detroit. Martino Home Improvement will match the right type of insulation to match your needs- and your budget! Anyone living in the Detroit area or any part of Southeast Michigan knows just how much the weather can change. From steaming hot summers to ice-cold winters – and just about everything in between – it is for precisely these reasons that a properly insulated home is a must! In Fact, According To The Harvard University School Of Public Health, You Probably Already Own One Of The 46 Million Under-Insulated Homes In The U.S.
Are you wasting money this season on heating bills? According to the Department of Energy, the average home in Southeast Michigan requires attic insulation with a minimum R-value of R-49 to R-60. However, older homes are notorious for not having adequate insulation. Depending on the age of your home, you could save 20%, 30%, or even 45% (or more!) on your heating bills this season just by having the correct amount of insulation in your attic. With the economy in such an uncertain state, ensuring your home is properly insulated is more important than ever before. No one wants to spend more money on heating and cooling than is absolutely necessary. If your home energy bills seem to be out of control, it might be time to have your insulation inspected by a professional. The U.S. Department of Energy estimates that 44% of all energy costs for the average home end up being spent solely for heating and/or cooling. The main reason for this? Critical areas of the home – the walls, attic, and floors – are inadequately insulated. Not having sufficient insulation in these areas can lead to warm or cool air escaping out of your home. If you don’t know whether these areas are insulated, if your home is more than fifteen years old, or if you are currently remodeling, now is the perfect time to call Martino for a free inspection. Attic insulation helps increase a home’s thermal efficiency all year round. During the cold winter months, sufficient insulation in the attic – normally in the form of rolled fiberglass, batts or blown-in insulation – keeps the warm air from rising out of the home and into the cold attic area. Because heat naturally rises, it can be difficult to keep your home warm on a cold night, but having proper attic insulation can eliminate this problem. Attic insulation also increases your home’s ability to keep cool during the warm weather months, preventing the hot air that fills the attic space from leaking downward into the rest of the home. For the best protection from frigid Michigan winters, attic blown-in insulation is your best bet. Unlike batts or rolls, blown-in insulation (fiberglass or cellulose) offers a seamless blanket of protection across your entire attic floor, preventing any of that cold air from making its way into the rest of your home. Walls that are properly sealed, fully insulated, and protected from moisture can improve the overall health and efficiency of your home in a variety of ways. You will have more moderated temperature control, a reduction in outside noise, and less air leakage through the walls. Walls make up the majority of the building envelope of the home, and are the largest portion of the home that faces outside air. 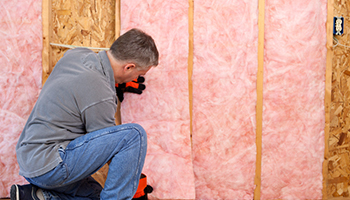 Taking the time to properly insulate can make a world of difference. Crawlspaces are commonly overlooked areas of the home that can allow unwanted entry of cold or hot air. This trapped air can rise upward through the floors and alter the internal temperature of the rest of the building. Properly insulating a crawlspace can keep this air from disturbing your temperature-controlled interior. Crawlspace insulation also helps to protect pipes from freezing or bursting during temperature extremes. Save money on your energy bill and keep your home comfortable in any season! Call Martino Home Improvement today and see what your home is missing.